El Pozo de los Frailes is a village two kilometers north of San Jose, Spain which has preserved a fine example of a "noria", an ancient agricultural structure typical of the arid countryside of Andalusia that was used to extract water from the subsoil for irrigation of the orchards and fields. It consists of two large wheels: a horizontal one, which is made to turn by an animal, and a vertical with earthenware jars ("congilones") or wooden receptacle that collects and holds the water. The "noria" of El Pozo de los Frailes appears in one of the initial scenes of the film "A Pistol for Ringo" (1965), when three bandits arrive at a village and ask a farmer where Ringo (Giuliano Gemma) is located. 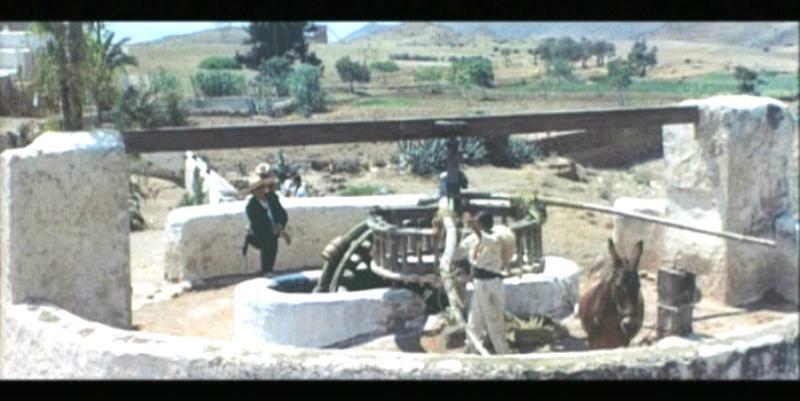 In the following sequence, Ringo eliminates the three bandits in a small square of a church in El Pozo de lo Frailes that is still intact. 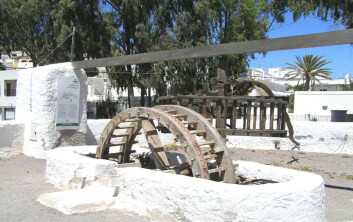 The same "noria" also appears in "A Bullet for Sandoval” (1969).